Introducing Our New Organic Gardening Kit! Everything you need for an organic home garden, minus the dirt and water! Want to grow your own food, but unsure of what you need to get started? Thinking of phasing out pesticides, herbicides, and petroleum-based fertilizers and making the switch to environmentally sustainable methods? We have a kit for that! As part of our mission to help people grow food, we are proud to be introducing a new Organic Gardening Kit to support anyone who wants to cultivate vegetables and herbs on a small scale, whether it’s in their backyard, window box, or community garden plot. A detailed look at the kit's contents. The gardening kit’s friendly look and feel were created by talented local designer and RISD graduate Audrey Barnes. Contained in the small box are three varieties of vegetable seeds plus cover crop seeds (used to replenish soil during the off-season); plant stakes, and naturally-derived liquid fertilizer and pesticide. The fertilizer is made from fish emulsion (the byproduct of North Atlantic seafood processing) and stays good for up to two years, giving your plants a boost of the essential micronutrients nitrogen and phosphate. The pesticide is “No Bug Soap,” a spray that is safe to use around kids and pets and will not harm beneficial insects. No Bug Soap is made of potassium salts and works by weakening insects’ outer shells. It breaks down into natural components within 7-10 days, meaning that there is minimal residue left behind. Directions for applying both products and planting the seeds are printed right on their packages. The kit will sell for $30 and will be available at select local farmers’ markets and at the Annual Plant Sale May 14th and 15th. Make sure to stop by and pick up one for yourself so that you have all the tools you need to grow your own this season (just add dirt and water). They also make great gifts for family members and friends! All proceeds will go to support our community gardens and the new Providence Community Growers Network. On Saturday, we launched the pilot hub of the Providence Community Growers Network at the Davey Lopes Recreation Center in south Providence. The Growers Network is a new initiative designed to connect urban food-growers of all kinds and scales—community gardeners, home gardeners, market gardeners, and school gardens—to resources, skill-building opportunities, and one another. Through the Network, gardeners throughout Providence will eventually be clustered around six organized neighborhood hubs. At the launch of the first hub here in our own neighborhood, fifty people from all across the city joined us for a free workshop introducing organic growing principles followed by the distribution of compost and seeds, giving them everything they needed to get started cultivating their own vegetables and herbs this year. We were happy that so many new and experienced gardeners turned out and signed up to be part of the Network; it was truly inspiring to see all of them coming together around a shared commitment to homegrown, healthy food. We invite even more people to get involved by joining the Growers Network, coming to our 30th anniversary events and free and low-cost Plant Providence workshops, and becoming members of the Community Land Trust. In the meantime, we hope you enjoy this slideshow of images from the event last weekend—images of neighbors helping to fill buckets of compost, comparing notes about different varieties of seeds, and sharing growing techniques. On this Earth Day, these photos really remind us about the impact of gardens: not only do they show us how we are linked to the soil, but to each other. Southside Community Land Trust is wishing you a Happy Earth Day. We encourage you to take a moment to cultivate the earth, honor the soil, and appreciate natural resources today. There’s no better way to celebrate Earth Day than to put a seed in the ground and grow some food! Clean Water Action’s Earth in JeoParty: Friday, April 22nd, 6-9pm at Local 121 in Providence, RI – Music, food, drinks, and more to benefit Clean Water Action. Easter-Earth Day Cleanup: Sunday, April 24th, 10am at Hope Artiste Village in Pawtucket, RI. As part of a series of Earth Week events, emPOWER, a student organization at Brown University, is bringing noted environmentalist and writer Bill McKibben to deliver a talk next Friday the 29th at 3:15 p.m. on the Brown campus. Along with the Center for Environmental Studies at Brown, the Community Land Trust is co-sponsoring the event in honor of our 30th anniversary this year. We invite everyone to attend the lecture! See below. Work on the 2011 Plant Sale poster is also underway! Every year, the Community Land Trust commissions a local artist to create a brand-new design. Far more than a simple flyer, these posters are beautiful, one-of-a-kind works of art that commemorate each sale and celebrate the talent all around us in Providence. The 2011 poster is being hand-drawn by Ian Cozzens of Secret Door Projects, who has produced posters for the last two sales. Click here to read Ian’s blog entry about the creative process, see a preview of the poster, and watch him at work! The rainwater collection system under construction. Last week, our longtime partner Casa Buena Builders installed a brand-new rainwater collection structure at the Dexter Ave. Community Garden! The system uses a shelter with a 100-square-foot corrugated metal roof to channel water into a gutter that spills into an adjoining 250-gallon barrel. The barrel is situated slightly uphill of the garden plots; gravity will provide enough pressure to use a hose. Now, our gardeners at Dexter not only have a free replenishable water source, but also shade from the midday sun! The project was made possible by a grant from the USDA; another system is in the works for the Mystic Miner Community Garden as well. If you’d like to learn how to set up a rain barrel for your own garden, come to our free workshop tomorrow evening from 6:00 to 7:00 p.m. at the African Alliance Community Garden (32 Diamond St. in south Providence)! Click here for more info. Laura Lavoie-Brown in the greenhouse at City Farm. Meet Laura Brown-Lavoie, our new City Farm apprentice for the 2011 growing season! We’re very glad to have her on board this year. Laura first started farming midway through her college career at Brown, where she was studying creative writing. She had decided to take a break from classes and spend a few months abroad working on a farm in France. The experience, she says, gave her a new raison d’etre. “After I got back, I returned to school, but I missed farming. I felt like I was rotting in the library. So I started looking up urban farms on the internet, and I found City Farm.” She volunteered there once a week throughout the summer of 2009. Over the next year, Laura continued to seek opportunities to participate in small-scale agriculture while finishing up her degree. That fall, she completed an independent writing project centered on urban farming, dividing her time between City Farm and Red Planet Vegetables, and last summer, she helped to start a garden for a restaurant in Maine with her sister, Tess. We were delighted the other day to welcome Edible Rhody editor Genie McPherson Trevor and publisher John Schenck to our offices. They had come to present us with our 2011 Local Hero award—their reader’s choice for non-profit organization, announced earlier this year! We are very proud of this distinction, which feels especially meaningful given that it comes during the Community Land Trust’s 30th anniversary year of helping people grow food in Providence. Our work is profiled in the spring issue of the magazine—click here to read the wonderful article written by writer and friend of the organization Christine Chitnis! Thank you again to the staff and readers of Edible Rhody for this honor and for their commitment to supporting homegrown and locally prepared food across the state. Several SCLT staff members were on hand to accept the award (from left to right: AmeriCorps VISTA Skye Hibbard-Swanson, outreach director Jessica Knapp, development assistant Michelle Walker, board member Vera Wayne, director of operations Liana Cassar, executive director Katherine Brown, director of development Susan Sakash, and Community Growers Network director Liza Sutton). Board member and 30th anniversary co-chair Vera Wayne posed with the award. Breaking the Grass Ceiling – RI’s Successful Women in Agriculture Conference! Christina in her greenhouse at Urban Edge Farm. We are thrilled to hear that! Thanks for the update, Christina. We commend you for giving back by encouraging more women to follow in your stead and start their own independent farming businesses. p.s. To read more about the Women in Agriculture conference and the role of women in farming, see this informative article from ecoRI. 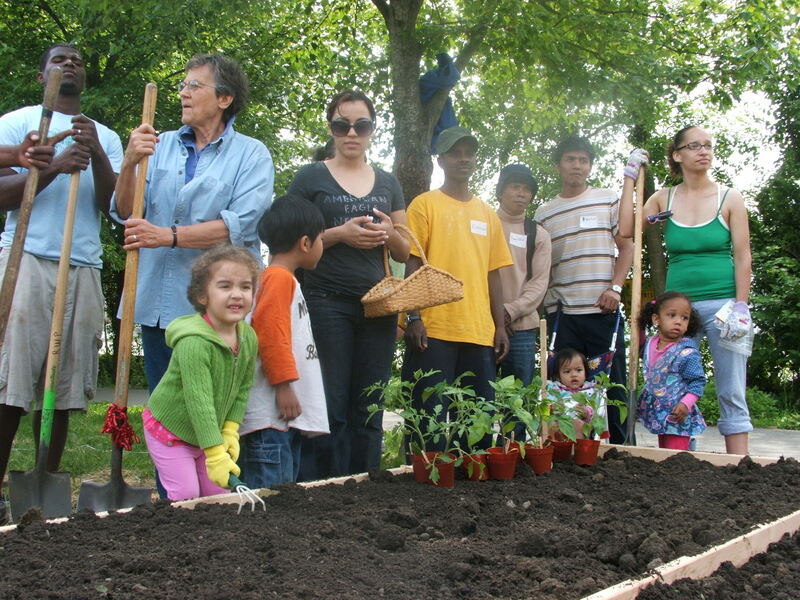 This weekend, as you are out about town, keep an eye out for your neighborhood community gardens. Across the city, over 750 families will be adding that compost to their wintered garden beds to start growing full-speed for the season ahead. Are you a home gardener or school gardener wanting to get in on the Black Gold delivery? The Community Land Trust is having its first HUB compost delivery day on Saturday, April 16th at the Davey Lopes Recreation Center at 227 Dudley Street following the first Beginning Organic Growers Series workshop on Planning and Planting. Sign up to be part of the Providence Community Growers Network and pick up your compost on the 16th. More details on the Providence Community Growers Network are available by contacting Liza Sutton at gardennetwork@southsideclt.org.